Associate Professor Sian Halcrow from the University of Otago, New Zealand, and her colleagues from Universities in the United States, Sweden and Chile, have highlighted a number of concerns about research into the 'Atacama mummy', undertaken by researchers from Stanford University. Credit: University of Otago. University of Otago-led international collaborative research calls into question the ethics and skeletal and genomic analysis surrounding research into the much publicised alien-like "Atacama mummy". 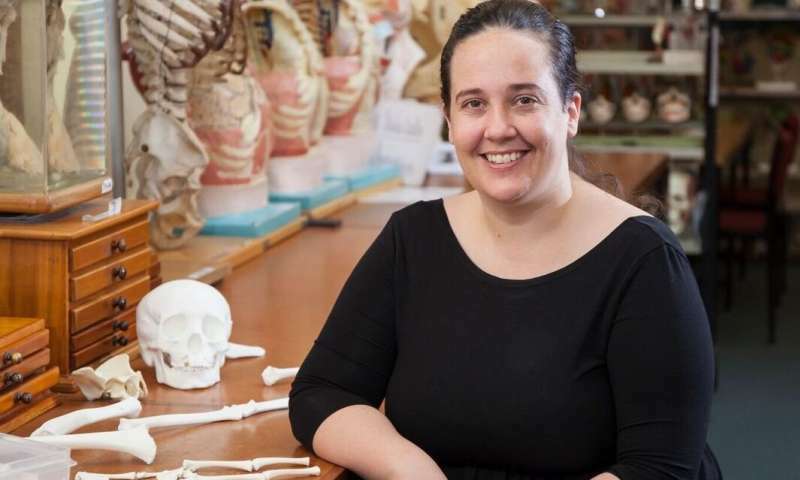 University of Otago bioarchaeologist Associate Professor Sian Halcrow led an international research team focusing on the very small mummified body, whose findings are published today in the International Journal of Paleopathology. The team evaluated work carried out on the body by Stanford University researchers, which was published in Genome Research earlier this year. The mummy in question was discovered more than a decade ago in an abandoned town in the Atacama Desert of Chile and nicknamed "Ata". In analysing this tiny mummified body, the Stanford researchers concluded genetic abnormalities could explain perceived abnormal characteristics of the skeleton, which was only 15cm long. However, Associate Professor Halcrow and her peers from Universities in the United States, Sweden and Chile, have highlighted a number of concerns about the ethics, skeletal and genomic analysis around the research. As experts in human anatomy and skeletal development, the Otago-led research team found no evidence for any of the skeletal anomalies reported by the Stanford researchers. All the abnormal characteristics cited by the Stanford researchers are part of normal skeletal development of a foetus, the Otago-led research team say. "Unfortunately, there was no scientific rationale to undertake genomic analyses of Ata because the skeleton is normal, the identified genetic mutations are possibly coincidental, and none of the genetic mutations are known to be strongly associated with skeletal pathology that would affect the skeleton at this young age," Associate Professor Halcrow says. The situation highlights the need for an interdisciplinary research approach for a case study such as "Ata", she says. "This case study allows us to showcase how drawing together multiple experts in osteology, medicine, archaeology, history and genetics is essential for accurate scientific interpretations and for considering the ethical implications of genomic analysis. Co-author Bernardo Arriaza, a bioarchaeologist from the University of Tarapacá in Chile says it is crucial to consider the archaeological content in addition to an interdisciplinary approach. It is important to remember the situation is a pregnancy loss possibly from the very recent past. "This mummy reflects a sad loss for a mother in the Atacama Desert," Dr. Arriaza says. The Otago-led research team also highlighted concerns around archaeological legislation and the ethics of carrying out research with no ethical consents, nor archaeological permits cited by the Stanford researchers. "We caution DNA researchers about getting involved in cases that lack clear context and legality, or where the remains have resided in private collections. In the case of Ata, costly and time-consuming scientific testing using whole genome techniques was unnecessary," Associate Professor Halcrow says. Associate Professor Halcrow is also disappointed that she and co-author, Kristina Killgrove, from the University of North Carolina at Chapel Hill's Department of Anthropology, were unable to submit a response to the article and research in question to Genome Research. "We were both told that Genome Research does not publish letters to the editor, only original research papers, despite senior authors Nola and Butte's (the Stanford University researchers') later response statement in which they seek to justify the ethics of their analyses," Associate Professor Halcrow says.